Tell this story.It is best told after dinner since it contains some gruesome details.It is told from Mary Reed Newland’s book, The Saints and Our Children. Here is a story to remember when one is tempted to sin with his hands. Directions:Isaac Jogues was one of the French Jesuits who came from France in the seventeenth century to bring the gift of Baptism and the Faith to the Indians in the New World. It would be hard to find in all the lives of the saints a story more filled with danger, terror and blazing love than that of these Jesuits. Men ofrefinement from gracious homes and loving families, who entered religion and lived surrounded by the love and the regard of their brother priests, they left all for a life of utter deprivation that was harder than their wildest imaginings. The people they had come to serve were truly savage. Suspicious, crafty, cruel, unclean, coarse, impure, accustomed to the most primitive ways, these children of the One God worshipped many gods and offered them many things in sacrifice, including the flesh of their enemies which these Indians often ate. To such people the Jesuits adapted themselves, gave themselves. Nothing in the lives of the early martyrs of the Church surpasses these modern martyrs. Their story is a must for every boy and girl, mother and father. It is a tale of how men are supposed to love — as their Master loves — to the last drop of blood and the last shred of flesh. The plague of the French settlements on the St. Lawrence and of the Jesuits working among the Hurons was the Iroquois, the five nations of Indians below the St. Lawrence occupying what is now part of New York State. Among these tribes the Mohawks were the most fierce and their avowed determination to wipe the Hurons from the face of the earth kept them constantly on the warpath, harassing both their enemy and their enemy's French friends. 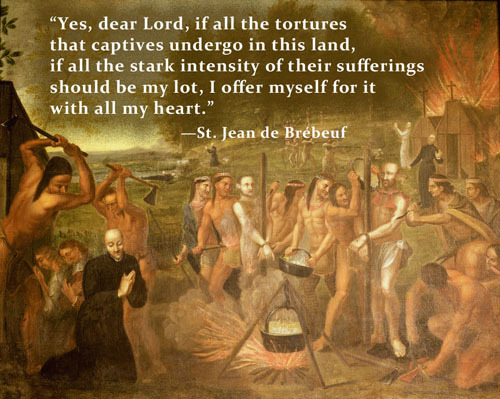 On the morning of August 2, 1642, a party including Father Isaac Jogues, René Goupil, William Couture, several Christian Hurons and others, forty in all, were ambushed and captured. The Mohawks did them unspeakable violence. It is hard to imagine that ever in the history of mankind have there been blood baths worse than these. The torture march took them mile after mile, sometimes on foot, sometimes cramped in canoes, bleeding, infected, feverish, set upon wildly at the nightly encampments and dragged about by the hair, the beard, pinched, plucked, probed, pierced for the delight it afforded their captors. Entering encampments and villages, they were forced to run the gauntlet, climb the torture platforms, endure the same outrages repeated for the amusement it afforded the villagers. At night they were tied to the ground, their hands and feet staked, andleft for whatever torments the women and children devised. It amused the Indians to sprinkle hot coals on the prisoners' bodies and wait to see if the captives would betray their pain. Years of hardening in the forests, enduring the fierce Canadian winters, living with the minimum of shelter, clothing and accommodation had seasoned and tried the fortitude of the Indians. Love of God accounted for the fortitude of the priests. They knew the worst lay ahead of them with their arrival at the village of their captors where they would again be tortured and at last, Perhaps, mercifully meet death. The day came. Hideously "embraced" by the villagers who met them at the bank of the river, they were marched across a ford and herded into a field. The Mohawks solemnly offered thanksgiving to the sun and to the war demons who had delivered the French and the Hurons into their hands to be roasted and eaten. Next the prisoners were forced to run the gauntlet: William Couture the catechist was first, then the Christian Hurons, followed by René Goupil, more Hurons, and last of all the prize, the hated blackrobe Ondessonk — IsaacJogues. The assaults were unbelievable. Jogues reached the end of the gauntlet to find his comrades "a bleeding pile of bodies. . . . Worst of all was Goupil. His face and head were smeared over with blood, so that there was left no white except that of his eyes. His features were smashed and swollen. . . . So pitiable was his condition, that he would have inspired compassion in cruelty itself. I found him all the more beautiful as he had more in common with Him who, bearing a face most worthy of the admiration and delight of angels, appeared tous, in the midst of His anguish, like unto a leper." Next they were made to ascend the platform. Again they were beaten, cut, the skin of their fingers slit; then an old man, a sorcerer, ascended the platform dragging after him an Algonquin squaw named Joan who was known to be a Christian. He drove the others off and gnashed the fingers of Ondessonk in his teeth. "I hate this one most of all," he cried, and he ordered the Algonquin woman to cut off the left thumb. She shrank away, horrified. She loved the Blackrobes and their God, but the old man and the braves hedged her about, threatening to kill her if she delayed. Finally she took the knife and shaking with fright and terror horribly hacked off his thumb. He endured it silently. He saw his thumb lying at his feet where the woman had dropped it. "Picking up the severed thumb with my right hand, I offered it to You, my living and my true God, for I remembered the Holy Sacrifices which I had offered to You upon the altars of your Church through seven years. I accepted this torture, O my God, as a loving vengeance for want of love and respect that I had shown in touching Your Holy Body . . ."